Welcome to Meva Seas, a stunning seafront modern home offering panoramic coastal views and the finest of home-from-home luxuries. 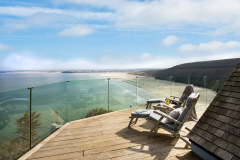 If you yearn for the freedom, fresh air and tranquility of Cornwall then check-in to Meva Seas and live the holiday highlife from this spectacular elevated position. 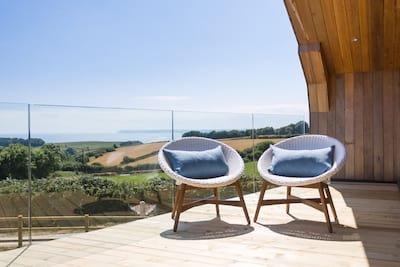 The house offers 4 luxury bedrooms, 4 contemporary bathrooms, a light and spacious open plan living, dining and kitchen space and landscaped coastal garden including heated clifftop plunge pool and bubbling hot tub under a stylish gazebo. The coastal harbour of Mevagissey is a wonderful place to explore offering a taste of traditional Cornwall with a welcome fusion of stylish cafes and restaurants. Meva Seas is a detached newly created contemporary home set in a prominent sea-facing location high above the blue waters of St Austell Bay. Once inside, this luxury home has been thoughtfully designed to maximise the coastal aspect. 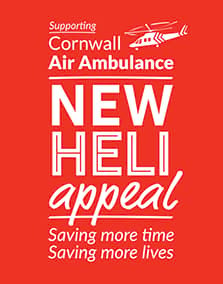 Lead into the hub of the house, the spacious open plan living area, flooded with natural light, where families and friends come together to plan the day's itinerary, to dine on the finest of Cornish food and to relax in true holiday style. 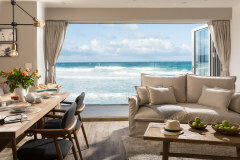 The fully fitted kitchen offers all you could need to create a lip-smacking menu and be it hearty brunch before a day at the beach, long lunches or celebratory dinners with all the trimmings. Children and adults alike will enjoy the cinema come media room where favourite films can be watched. A separate utility room and shower room complete the ground floor layout. A central staircase leads to the first floor and collection of 4 stunning bedrooms and 3 bathrooms. Each room has been beautifully presented with the finest linens and welcoming colour palette of soft whites and coastal hues. Step out to the landscaped garden and immerse yourself in the blues and greens of the coast and rolling headlands. Paved terraces and green astro turf lead to the welcoming plunge pool and bubbling hot tub. Soak away the day under the stylish gazebo and watch the world sail by, what could be better? An outside dining table offers a persuasive al fresco dining option whilst you fire up the Big Green Egg BBQ. Paths lead around both sides of the house to the front. 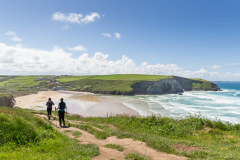 Beyond the boundary of the property is a field that gently slopes down to the South West Coast Path leading you along some of the most beautiful clifftop pathways, hug the coastline around the point towards Pentewan Sands. Mevagissey oozes Cornish charm, from the colourful fishing boats hauling their daily catch, artisan bakeries and cafes and curio souvenir shops. 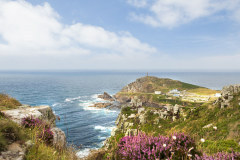 Enjoy fine pub grub with a local atmosphere, homemade pasties on the quay or more fine dining experiences. 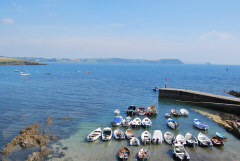 Guests can walk down to the harbour from Meva Seas in approx 10 minutes. 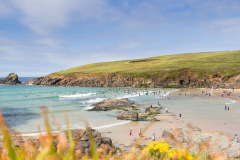 The nearest beach to the house is Portmellon, a sandy cove and great for swimming! 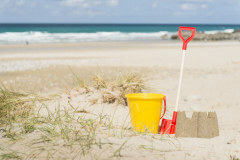 The South Coast offers a plethora of activities from bike trails at nearby Pentewan, deep sea fishing from the harbour, National Trust and private gardens (including The Eden Project and The Lost Gardens of Heligan), watersports, sailing and kayaking - whether young or simply young at heart, immerse yourself in the verdant countryside and coastal playground. If day trips are on the agenda then visit the maritime town of Fowey which is a mecca for sailors the world over or the historic village of Charlestown known famously for its film set popularity including the more recent backdrop to BBC's Poldark. 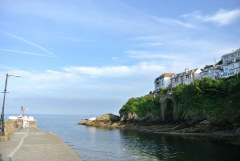 Heading West, Mevagissey is a gateway to The Roseland Peninsula, a stunning unspoilt peninsula flanked by sheltered waters and tucked away villages including Portscatho and St Mawes. Two retracable stairgates in place on the stairs. Private outdoor heated plunge pool available from Easter to end of September each year. The pool length is 5.25 meters by width of 2.5 metres. The depth is 1.2 metres. There is an electric pool cover. Two dogs are welcomed at Meva Seas, the garden is enclosed, please note that the pool area is enclosed with a low glass panel to detail the boundary rather than a safety feature. Beyond the boundry are fields leading down to the coastal path. There is a very slight slope from the parking area to the front door. Level access from the inside onto the veranda. Please note that the pool area has a low glass panel to detail the boundary rather than a safety feature. A spectacular coastal home in which to relax, unwind and soak up the stunning seascapes.